I always knew my father had four siblings, Lilly, Mable, LeRoy and Johnnie. Well, technically, not four, because I knew LeRoy was actually his cousin, not his brother, but my Grandma Maggie had taken LeRoy in and raised him as her own. What I didn’t know until my Grandma died was that Lilly was not her daughter, but actually her step-daughter. Huh. My Grandmother, Maggie Johnson married my Grandfather, John Henry Shoults on March 14, 1919 in Craighead County, Arknasas when she was 17 and he was 21. The marriage record is in the name of Johnie Schultz, but I found it was not unusual to see multiple spellings of the same name. I encountered that many times when telling someone my name was “Shoults”. Because it is pronounced with the German pronunciation, everyone automatically tried to spell it “Schultz”. I would say “Shoults, S-H-O-U-L-T-S” and they would look at me like I was crazy and insist there had to be a “c” or a “z” in the name. A practice in the southern parts of the United States at that time, was the posting of a Marriage Bond. A man intending to marry would go to the courthouse, most normally with a relative of the bride and sign a bond pledging a certain amount of money as surety that he was legally able to marry. If for some reason it was found that he was not free to marry, he would have to pay whatever sum was indicated on the bond. On the same day that Maggie and Johnie were married, another couple, Luther Scott and Lillie Whitaker were married and Luther Scott signed Johnie’s Marriage Bond. Lillie Whitaker was later found to be a cousin of John Henry. Maggie and Johnie (John Henry) are listed on the 1920 census for Craighead County living next door to Maggie’s mother and step-father, William and Martha J. Spears. But, its just the two of them. If Lilly was John Henry’s daughter from a previous marriage, where was she? Fast forward ten years to the 1930 census. John H. Schults and Maggie Schults (what did I tell you about spelling?) are listed with their children: John C. (my uncle Johnie Copeland), age 8, Charles E. (my dad), age 4, Mable Irene, age 10 and Lillie Loudise, age 12. Every ten years, another census was taken, and each census record asked for different information. The 1930 census asked for the age of the individual at their first marriage. John H. listed the age of his first marriage as 17. The mystery is, who was Lilly’s mother? 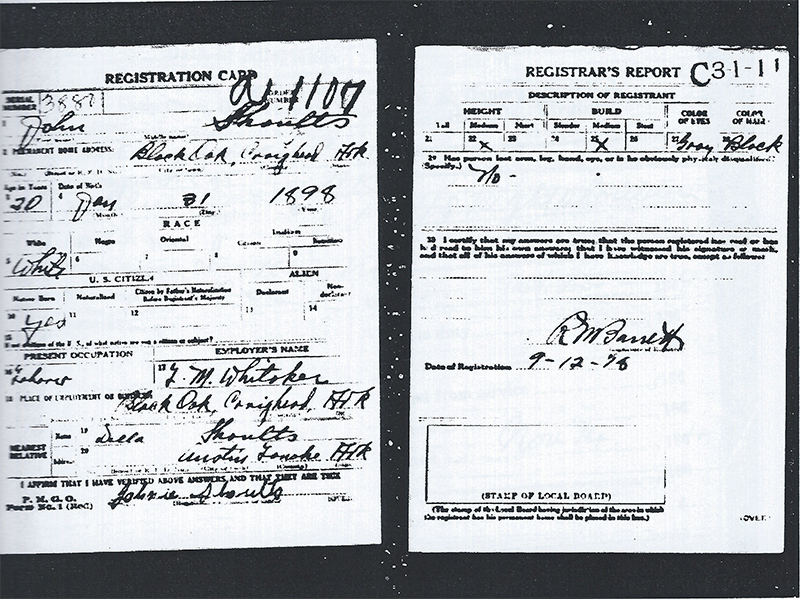 According to Johnie Shoults’ September 12, 1918 World War I draft registration, his closest relative is “Della Shoults” living in Austin, Lonoke County Arkansas. Johnie lists his occupation as a laborer for Luther Whitaker. The answer to the question of who Lilly’s mother was came several years later after my research was begun. According to Arkansas County Marriages 1837-1957, on September 20, 1916, Johnie Shoults who lived in El Paso, White County, who gave his age as 21, married 18 year old Della Lea in Faulkner County. I was able to find why Lilly wasn’t listed with John and Maggie in 1920; she is living with Luther Whittaker and his wife, Hattie Whittaker. So, Della Lea most probably died (although I was not able to find her on any Arkansas Death Records) and Luther and his wife took Lilly in and raised her until the widowed John Henry remarried or was capable of caring for her. Remember the girls from the photograph on my post I Started Asking? 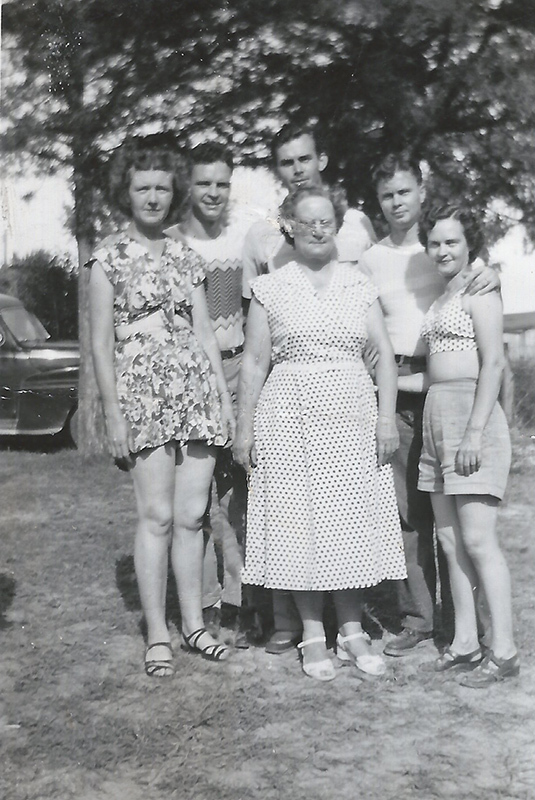 One of the girls was my great aunt, Callie Mae. Callie Mae Shoults married John R. Whittaker and they were living near to Luther, Hattie and Lilly in 1930. Most probably, John R. Whittaker is related to Lilly Whittaker and that was how my aunt, Lilly, came to live with them. Callie was my grand mother. My dad was James Colter. Aunt Irene was dad’s half sister. I would like to know more about my family. Nice to meet another “shirt-tail” cousin. I’ll share any information I have. Let me know what you need. I’m thankful I came across this.